Whig general, was killed at Cowan's Ford, Feb. 1, 1781. Davidson College and Davidson County are named for him. 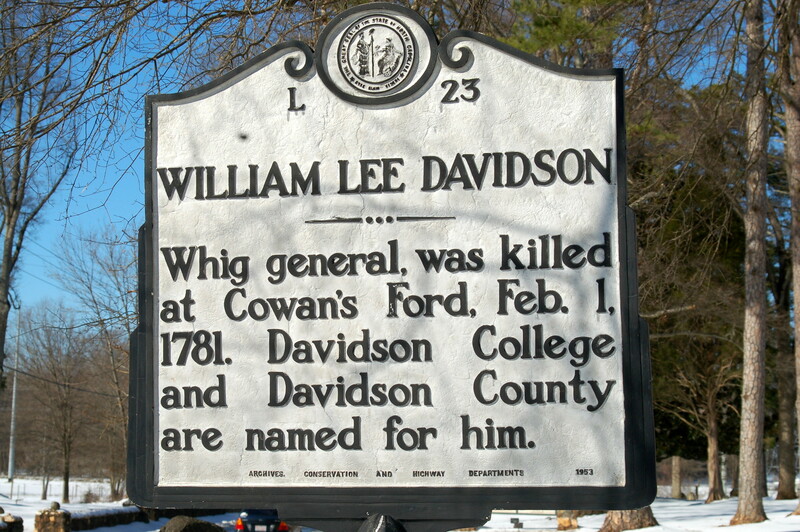 William Lee Davidson, for whom both Davidson County and of Davidson College are named, was born in 1746 in Lancaster County, Pennsylvania, the son of George Davidson, an Irish immigrant. William’s mother apparently died in childbirth, and George Davidson joined the migration from Pennsylvania to the Piedmont of North Carolina, eventually settling along Davidson’s Creek in Iredell County. When his father died in 1760, William was placed under the care of Alexander Osborn and John Brevard, two of the wealthiest men in the area. Under their patronage, Davidson attended Sugaw Creek Academy near Charlotte and studied under Alexander Craighead. In 1767, Davidson married Mary Brevard, John’s daughter, and sister of Ephraim Brevard, one of the authors of the Mecklenburg Resolves. Davidson served briefly with his regiment in the defense of Charleston during the summer of 1776, before being transferred to George Washington’s Main Army in the north the following year. His unit saw combat during the Philadelphia campaign in September and October of 1777, and Davidson was promoted and appointed lieutenant-colonel of the 5th North Carolina Continentals replacing Henry Irwin, who had been mortally wounded. He remained with his unit throughout the winter and spring of 1777-1778, suffering alongside his men at Valley Forge. When the North Carolina line was reduced from nine regiments to three due to losses in June 1778, Davidson was transferred to the 3rd North Carolina and again to the 1st North Carolina a year later. After his transfer to the 1st North Carolina, Davidson asked for and received a furlough to return home, thus managing to avoid being captured with his regiment at Charleston in May 1780. Without a Continental command, Davidson accepted a temporary appointment as a brigadier-general in the state militia, leading local Whigs in the Fight at Colson’s Mill in July 1780, where he was severely wounded. In the winter of 1780-1781 Davidson returned to the field, helping raise militia units to aide Nathanael Greene’s army in their escape from Cornwallis across the Carolina Piedmont. On February 1, 1781, Davidson’s militia forces attempted to delay Cornwallis’s crossing of the Catawba River at Cowan’s Ford. His men held against a vastly numerical superior force until Davidson fell dead from multiple gunshots. Davidson’s death was much lamented in the American ranks. Described as the “chief instrument relied upon by Greene for the assemblage of the militia,” Davidson was remembered as “a man of popular manners, pleasing address, active and indefatigable.” His pistols, sword, and wallet were taken by British forces and given to Cornwallis after the skirmish. They are on display at Guilford Courthouse National Military Park in Greensboro.